Anyone who knows me well, knows I struggle with maintaining our home. It’s been a long struggle to pull myself out of the chaos and into some semblance of order. I could probably write a million posts on this topic, and maybe one day, I’ll delve a little deeper into this and share it with you all. For now though, I think it’s enough to say, that the difference from 6 years ago to now is almost night and day. Or, it was. A year ago, I had maintaining the house down to a science. It wasn’t perfect 100% of the time, but really, who has time for perfect? I was ok with it the way it was. 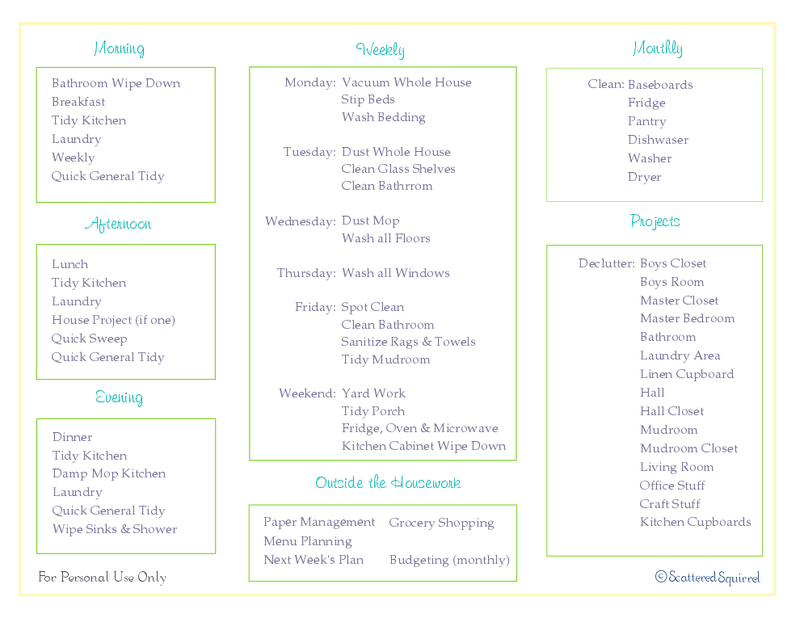 Everything on my list got done each week, and seriously, in around an hour a day Monday-Friday, I was able to keep the house clean and tidy. The only times I slipped were when I was in the middle of an organizing projects, and even those times weren’t too bad. Careful planning and the regular upkeep meant that I didn’t have a messy home before I started messing it up. (Let’s face it, when it comes to organizing, things tend to get messier before they find themselves all neatened up and in order) Now though, it’s a different story. Somewhere along the way I lost track of the routine that was working. And you know what? I did it to myself! Talk about self defeating. The simple explanation is that I got bored. The more complex reason is that I either read, heard, or saw something about house cleaning, and decided that I was doing it all wrong, that I needed to change how I did things. Silly? Yep! Stupid? Quite possibly! I got it into my head to change things up to do better, get closer to perfect, and the result…. well it didn’t work so well for me. 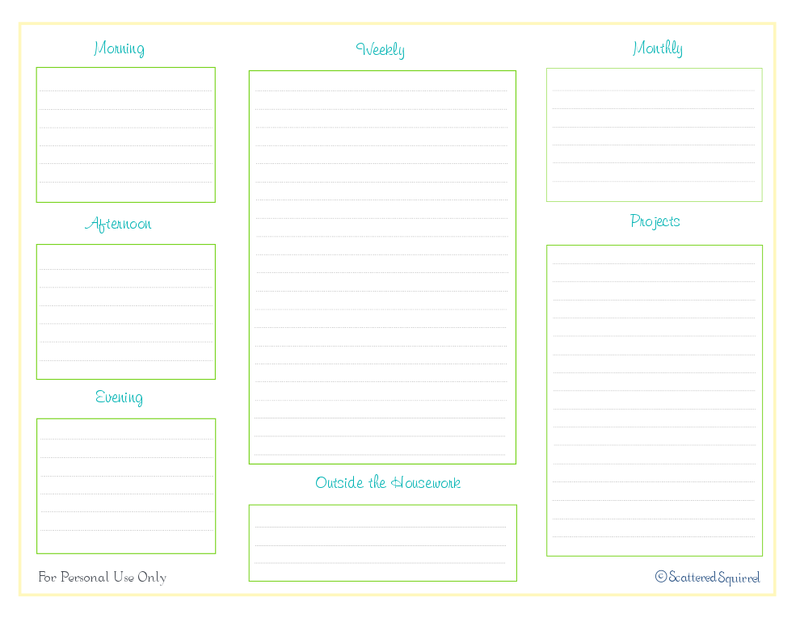 It was taking longer each day to do what I needed to do, and it left me with no desire to tackle organizing projects. I just didn’t want to have anything more to do in a day. I could kick myself for making that change, because getting back into a routine isn’t as easy as it seemed in my head. Another part of the problem is that for the last 6 years, our home has been my number 3 focus (outside Travis and our boys) I needed that time to really explore the problem, to wrestle with it, and find my solution. When I did have my solution, when all was going good, I didn’t have anything left to focus on. That was a big mistake. I won’t make that one again. You could say that after sharing stuff with family and friends, this blog is part of keeping myself on track. It’s giving me something else to focus on. I broke my daily tasks into morning, afternoon, and evening. This way, I can stay more on top of things as the days goes on, and avoid adding to the madness of the 4pm – 8pm rush. Next up, is my weekly tasks. I have them scheduled by day, because that is what works best for me. I don’t always stick to it, some days I may tackle more so I can free up another day. Under that is the non-housework stuff that I want to keep better track of. They’re usually weekly tasks, (aside from the budgeting) but most times I meal plan and grocery shop twice a month. The monthly section is just stuff that I need to remember to do each month. 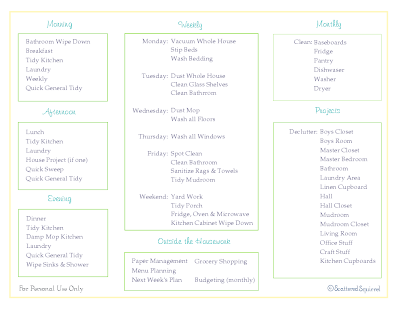 Under that is my projects list, which is all about regular decluttering, something I found to be extremely helpful in our little home. These are not things I need to do each month, but I try to get to two or three each month. I find the more I stay on top of it, the easier it is to maintain. Most of you will notice that I don’t have any quarterly, seasonal, or yearly tasks on this list. That’s because I have those ones in a separate area. 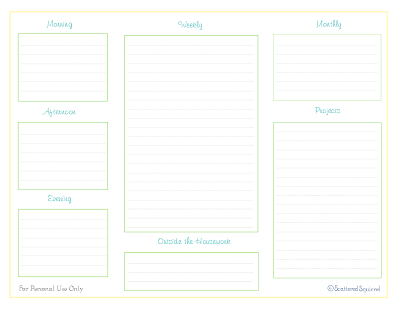 Right now, I have those jobs scheduled by month, and I’m hoping to put them together into a printable as soon. The main purpose of the above list is to to keep me focused during the day. I realize that my list won’t work for everyone, maybe not even anyone, so I also put together a blank one. I hope you enjoy! Just click the links below the pictures to get your own copy! Please let me know what you think. Are there ways you think the form could better? Other headings that would work better than the ones I’ve used? Leave me a comment and let me know! Well, now that I’ve gotten my new schedule done up, I guess there is no more excuse for not getting things done. So, I’m going to run. Not only do I have some house work to catch up on, I’ve also got a pile of office and craft supplies waiting to be sorted and organized. Hopefully I’ll be able to get that done and pop back on here later and share it with you! Until then, I wish you a fabulous day!!!! Previous Post: « Around the House in 40 days! I have tried numerous time to sign up for the news letter, but when the screen goes to Mad Mini, it will not send my information. Can you please sign me up. I can not get it to work.